How many people live around the world today? Will humanity keep growing indefinitely? How will population dynamics change in the next decades? What’s the link between population growth and development? How does development lead to smaller families? How many people live around the world today and where are they? How will global demographics change in the next decades? What should be the role of policy when it comes to population control? In 1820 there were about one billion humans living on earth. In 2016 there were 7.33 billion. Today we are close to 7.5 billion. According to recent estimates, today's population is about to 6.9% of the total number of people ever born. This chart shows the evolution of global population by regions. With the option 'Relative' you can see the changing shares of population across regions. This map shows where people live around the world. It plots population per square kilometer. Here is an interactive version of the same map, where you can click and drag the mouse to pan over regions, and where you can double-click on any spot to zoom in. In order to study how the world population changes over time, it is useful to consider the rate of change rather than focusing only on the total population level. This chart shows annual population growth rates, superimposed over total world population for the period 1750-2010, plus UN projections up to 2100. In 1962 annual population growth rates peaked, and since then, they have been going down. According to these UN projections, growth rates are likely going to continue decreasing through the century. Human population is not currently growing exponentially. The world is approaching what the late Hans Rosling called “the age of peak child”: the moment in global demographic history at which the number of children in the world stops increasing. The world has probably not reached 'peak child' yet. But as this chart shows, we are likely very close to a long flat peak; the number of children in the world will not increase much more. Globally, this means there will be what is often called a "demographic dividend". There will likely be new economic opportunities, because the proportion of people in working age will rise as the proportion of the dependent young generation falls. At the country level, many nations have already seen benefits from this demographic change. This chart shows the distribution of men and women across various age groups. These 'population pyramids' rely on data and projections from the UN. The pyramid for 1950 looks like a pyramid: the base is wide and the top is narrow. This reflects the fact that there is a continuous risk of death from birth on and through all ages. The pyramid in 2017 is wider at the top and narrower at the bottom, because child mortality is falling, so the risk of death is now more concentrated at older ages. In 2100 the pyramid will be almost like a box. There will be much less inequality in life expectancy – most people will survive young ages and deaths will tend to take place at an advanced age. The available projections show there will be important changes in the regional composition of people across different age groups. As this chart shows, changing demographics will imply that by 2100 half of the world's children under age 5 will live in Africa. The link between population growth and development can be understood through a simple model, called the 'demographic transition.' The model of demographic transition has five stages, which we explain in the next chart. – Stage 1: Population is stable. There is high fertility and high mortality; so deaths and births cancel out. – Stage 2: Population grows rapidly. There is high fertility but low mortality. – Stage 3: Population growth slows down. Social norms adapt to the fact that children survive. Fertility declines with increasing education and labor opportunities of women. – Stage 4: Population growth stops. Low fertility catches up with low mortality. – Stage 5: Population potentially starts growing again. The evidence here is limited, but the idea is that further social and economic opportunities may raise fertility again. This chart shows the demographic transition in action for five very different countries in Europe, Latin America, Africa, and Asia. The pattern is clear: first a decline of mortality that starts the population boom and then a decline of fertility which brings the population boom to an end. This is one of the most important lessons from demography: the population boom is a temporary event. Parents choose to have smaller families when they can be confident that their children will survive and thrive. This chart shows that the average number of children per woman tends to be higher in countries where child mortality is higher. Using the slider at the bottom of the chart you can trace changes over time. You can check that as child mortality goes down, fertility rates also go down. The choice of having a child requires parents, but especially mothers, to consider the opportunity costs that come with children – e.g. risking health, lower earnings, etc. Education drastically affects opportunity costs, and because of this more educated women tend to have fewer children. This chart shows that there is a correlation between women's education and family size, across countries and time. 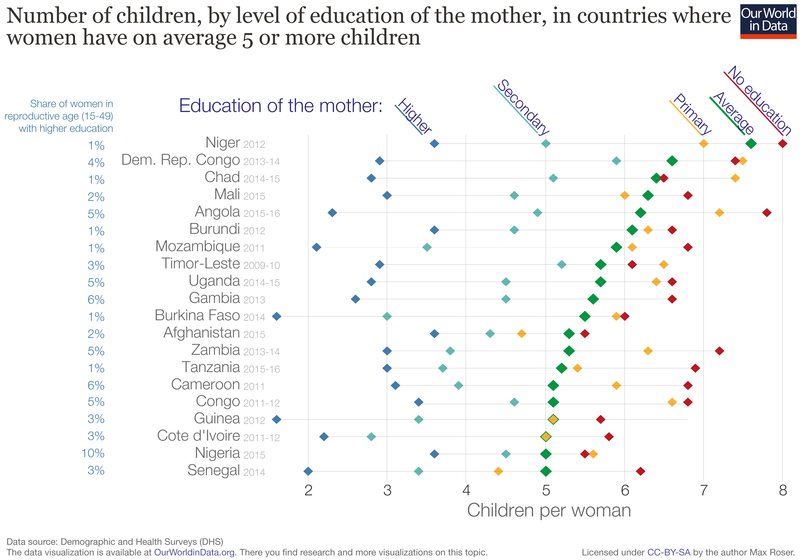 Looking at variation within countries shows the same: more educated women in a country tend to have fewer children. These correlations capture the direct effect of education on fertility, as well as other aspects, such as the fact that education often goes together with changes in social norms. This chart shows that in countries with higher average national incomes, families tend to be smaller; and within countries, richer families also tend be smaller. This correlation is partly driven by a causal mechanism: income affects desired family size because in poor families children often take care of parents in old age and during times of need. But it also captures other things – like the fact that higher incomes often go together with better health and education. Some studies have looked at exogenous shocks to fertility (e.g. contraception campaigns), and they have found evidence consistent with the causal link (e.g. parents who have fewer children often expect lower money transfers in the future and hence save more in anticipation). Family size is partly determined by social norms and views on the role of women. In many contexts discrimination is common and economic opportunities are scarce, so norms that limit women's options end up also having an impact on whether parents prefer having a boy. A study found that the introduction of cable television in India exposed people to new lifestyles, and this led to a decrease in son preference, an increases in women’s autonomy, and a decreases in fertility. In surveys on desired family size in which men and women are separately interviewed, men usually report a larger ideal family size and a lower demand for contraception than their wives. In many countries there's a large number of women who do not want to get pregnant, but are not using contraception. Lack of access to contraceptives is often a reality. But the evidence shows that simply supplying contraceptives is not enough to guarantee usage. Changes in social norms and female empowerment are also necessary. This chart plots fertility in China since 1945. It shows that fertility started to decline in 1970, long before the introduction of the one-child-policy. Taiwan, which is claimed by China as part of China, never introduced a one-child-policy but experienced the same decline. There is similar evidence from other countries. In India, for example, the "sterilization camps" from the 1970s were ineffective - and it is possible they actually contributed to population growth in the long run by eroding trust in family planning policies. It would be wrong to assume that people in poor countries, where families are larger, need external help to control their fertility. As this chart shows, fertility rates in poor countries are declining faster than they did in rich countries in the past. But of course: policies can help speed things up even more. As we have shown here, policies that promote education, health and better economic and social opportunities for women, are effective population policies.